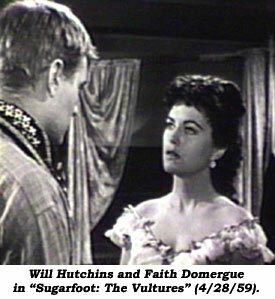 Elsewhere on Boyd’s website is Mike Fitzgerald’s fine interview with Faith Domergue. Imagine my distress to read that her worst experience while doing WB TV westerns was working on “Sugarfoot”. She blames the director, Josef Leytes, but, I’m afraid, the buck stops with me. A TV cowboy with his own show should be a good host. I should have seen to it that Faith had a fun and happy time while working on the episode called “The Vultures”. The show was well-named. I could imagine buzzards circling the carcass of that particular script. We were saddled with Russian opera, not horse opera. Besides, I was mis-cast. The part called for acting and at that time I had developed two expressions: Hat On and Hat Off. Nonetheless, I should have managed somehow to squeeze a modicum of humor and humanity out of that doozie. After all, Olivier brought a lot of laughs to his version of “Hamlet”. I drove to work each day in my blue Funk. I felt I was going to jail. My attitude reflected itself in a certain lack of cheerfulness and zeal on the set. I should have acted the magician and mis-directed Miss Domergue’s attention away from director and script and greeted her in the morning with a smile and a steaming burrito from the guy who parked his truck on the other side of the fence on the back lot. Yeah, Faith, Mea Culpa. We mustn’t fault Josef Leytes. He was Polish, so English was not his Mother Tongue. He had problems expressing what he wanted from his actors. William Wyler from Austria had similar troubles but Josef didn’t have Wyler’s luxury of 90 takes a set-up. Leytes’ strong suit was his use of the camera. Rather than the usual, tired, clichéd set-ups: (long shots, medium shots, over shoulders, and close-ups), he worked from an innovative, fluid European style of camera movement. He’d often get the scene shot in one flowing, continuous movement with no place for the editor’s scissors. We actors had to keep on our toes as we dodged a moving camera and mike booms without falling over the furniture. Along with the superb work of the WB camera and lighting people, Leytes would often get unique moody and shadowy stuff that you don’t often see in westerns. The folks at home might well have been confused. Sometimes, instead of Hoot Gibson they were getting Dracula. These one-shot scenes were fun for the actors. We could overlap our dialogue and not worry about matching our actions from shot to shot, because we only did it once. An audience can become confused and disbelieving by overzealous editing. The basic reason I was remiss in my duties as morale officer on “The Vultures” is because I was so in awe of Faith Domergue. I’d worked with Femme Fatales before but she was the Fatalest Femme of them all. I usually had a crush on my leading ladies, but like Sugarfoot, was too shy to do anything about it. I dated secretaries and waitresses. I have fond memories of all my leading ladies. All but one, that is. (Not Faith.) Too bad for the both of us that that “lady” and I were hooked up on two Sugarfeet. In the first one I was having trouble with my lines towards days end. She was antsy to get to a premiere and through gritted teeth she suggested that I take some vitamins. On our second epic she was supposed to play comedy. She was about as funny as a fall off a horse. I recently caught that show again on tape. In the obligatory final scene (Adioses, Hugs, Hearty Handclasps, We-Wanna-Thank-Ya-Fer-Watcha-Dones, Ride-Off-Into-The-Backdrop-Sunset) this actress in question could not conceal her utter disdain for me. I laughed mightily as I watched. It was the most honest moment in the history of “Sugarfoot”. I appreciate Faith Domergue’s tribute to my hoss, Penny. Next column I’ll reminisce about Penny.